I thought I would try a couple of different things. 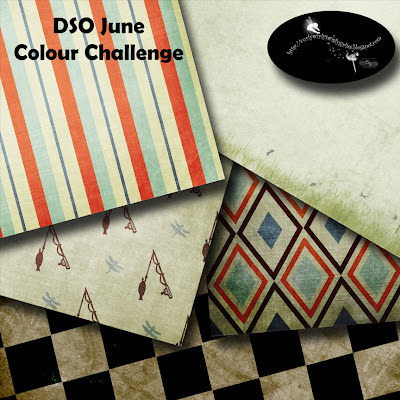 I have been a long time reader of KimB’s blog and thought I would have a go at one of the monthly colour challenges that she hosts at DSO. I also thought I would try something a bit grungier. So here is my go at the colour challenge. There is a bit of a theme of boys and creeks and fishing sort of thing to it. I really enjoyed the papers. The first one using brushes, which is not something I have done a lot of. The brushes are from the very talented Stephanie (Obsidian Dawn). I was really almost scared of using brushes when I first got in February. But like all things the more you play with it the more fun you have and the more you learn. I am so grateful that these beautiful brushes are available. They are so inspiring. I did a striped paper and used a grunge overlay from one of Shauna’s CU packs at Scrap Orchard. I did a bit of experimenting with them on the argyle which used one of Kim Sheen’s CU templates from Scrap Orchard, and also on the fishing rod paper and the check paper. I think the check paper is inspired by my laundry floor at the moment LOL. Mud glorious mud at our house after the rain. The denim paper has a stitched edge using Atomic Cupcakes’ action. It is not shown in the paper preview but is in that download, I just didn’t see the point in putting it on there when I had used it as a background for the elements preview. The papers can be grabbed here. Let me know what you think, it is a bit of a jump out of my rut LOL. oh erika, i LOVE LOVE LOVE these papers! i love the grungy look. it's another layer of texture to me. this is what i want to learn to create. i just dl'd some of stephanie's brushes to play with eventually. you are very inspiring, you know. thanks for everything: the goodies, the links to resources, the inspiration! Terrific papers! I love the DSO color challenge, Kimmie always comes up with a great swatch! Girl, you have been busy, I haven't had time to troll the blogs for a while, did I mention I am getting ready to go to Cancun for 6 days? ROTFLMAO!!! P.S. There is a tiny corner left in my suitcase! How friendly do you want to get with Rena?